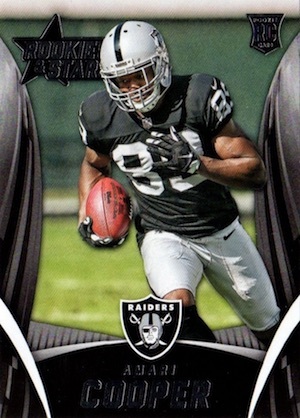 Amari Cooper has experienced many highs and lows in his NFL career and the same can be said for the various Amari Cooper rookie cards. 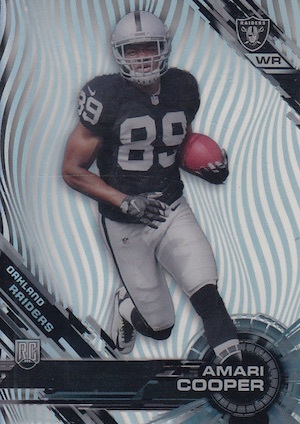 Nevertheless, things are on the upswing and collectors are again taking notice of the dynamic wide receiver. 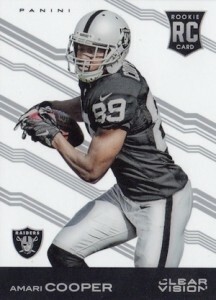 The fourth-overall pick by the Oakland Raiders out of the University of Alabama in 2015, the talent was always evident but consistent production was not. However, the early results look promising following a 2018 mid-season trade from the Raiders to the Dallas Cowboys. 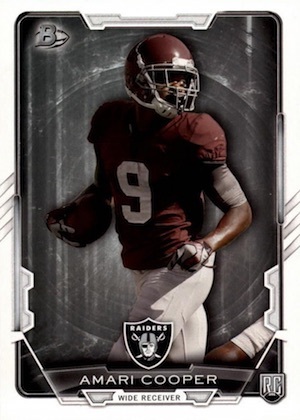 See the most popular Amari Cooper cards on eBay. 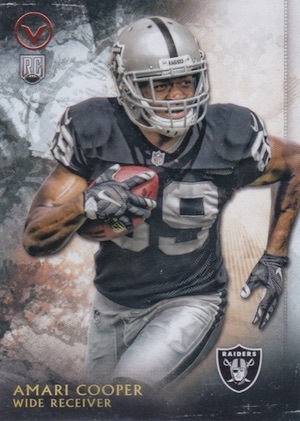 As one of the top names from the 2015 NFL Draft, collectors have plenty of choices for Amari Cooper rookie cards, which are found in most of the 2015 football products. All his official rookie cards are noted below. 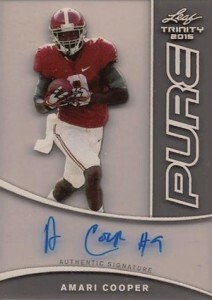 Below the main rookie list, key pre-rookie and college-themed cards are covered. Click on the images or listings to shop for cards on eBay. Bolded sets go directly to product profiles and checklists. On the low-end side of things for collectors in terms of value and design, 2015 Bowman is more about being first than being an ideal rookie card. The end result is not great. Look elsewhere. 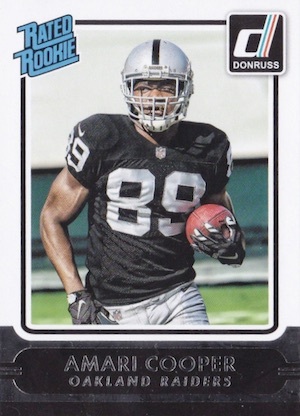 Simple and inexpensive, Amari Cooper's 2015 Donruss card takes advantage of Rated Rookie nostalgia. It will never be worth much, but for seasoned collectors, it offers a subtle reminder of the past. Although not numbered, this 2015 Donruss Signature Series rookie is tough to track down. A moderate jersey swatch is added to a sticker autograph. 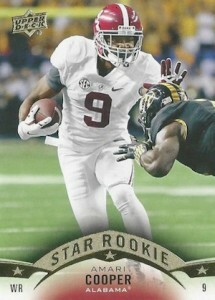 One of the top Amari Cooper rookie cards, collectors will only find redemptions in 2015 Immaculate Collection boxes. Thanks to the likely on-card signature, nice jersey piece, and a low print run, this should be a hobby standout when the card is available. 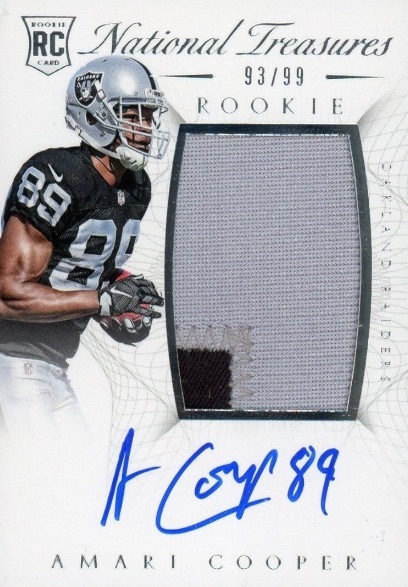 Extreme rarity and strong brand recognition combine in the 2015 National Treasures rookie card that boasts a large jersey piece and on-card signature. 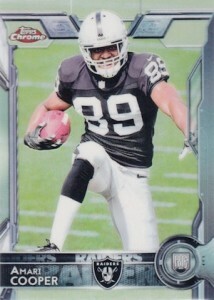 With just 99 copies, these are some of the very best Amari Cooper rookie cards out there. 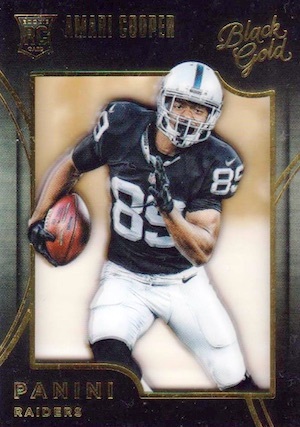 It can be tough to tell from the scans, but the 2015 Black Gold rookie for Amari Cooper is one of his most premium base rookies. Limited to just 199 copies, several parallels bring that number a bit higher. Shiny and bold, 2015 Certified features a solid patch, autograph and moderate print run. While the sticker signature is not preferred, it looks okay with this design. 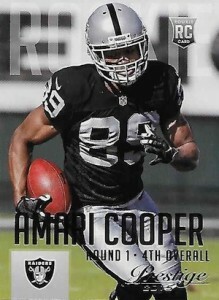 2015 Clear Vision presents collectors with two rookie card options for Cooper. The base version, on the left, and the variation, on the right, can be distinguished based on the different images and background design. 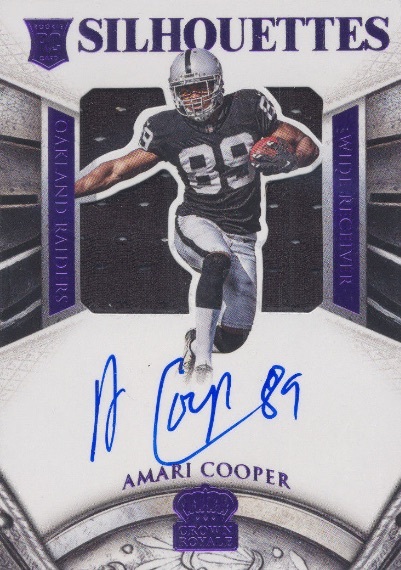 Easily one of his more popular choices, the Amari Cooper rookie in 2015 Contenders was issued as a redemption. 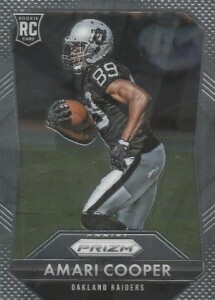 In addition to the base version, collectors can track down limited variations and multiple Rookie Ticket parallels. A third variation has a Crimson Tide college theme. Found in both relic and autographed relic versions, the 2015 Crown Royale rookie for Cooper features the popular Silhouettes design and the autographed version is signed on-card. 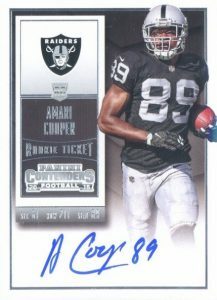 A massive box price tag and considerable rarity make the 2015 Flawless base rookie for Amari Cooper a very tough chase. The embedded gems adds to the high-end feel. Artistic and distinct, 2015 Gridiron Kings proves that even budget values can result in unique designs. 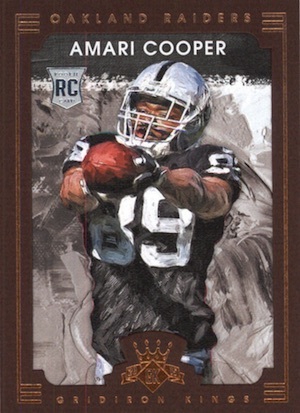 Admittedly, the black of the Raiders does clash with the brown border frame, but there are additional color parallels available. 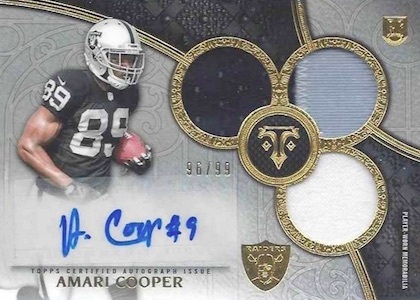 It does not have a true base set but 2015 Luxe offers multiple hard-signed rookie autographs for Amari Cooper. The metal-framed versions are arguably the most popular choice. 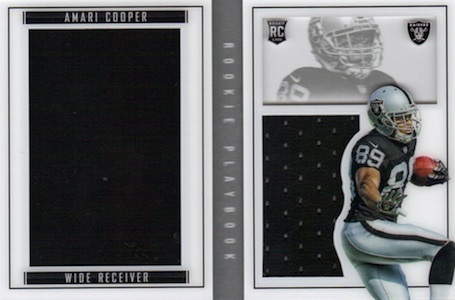 Offering a good bit of jersey, the 2015 Playbook rookie for Cooper utilizes a booklet design and there is also a signed option, limited to 99 copies, that features an acetate signature on the left side. 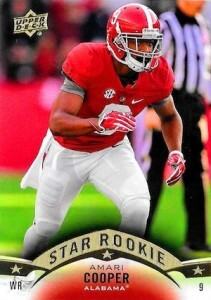 For many players, a college jersey on an NFL rookie card could be something of a disappointment, but given the strong following for Alabama, 2015 Prestige might fulfill two wants in one card for Crimson Tide fans. 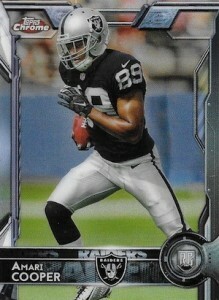 There is also a variation that features Cooper in his Raiders gear. Simple and modern at the same time, 2015 Prizm utilizes a large silver border and many colorful parallels to achieve a fun rainbow chase. Collectors can also find a limited image variation that is shown on the right. 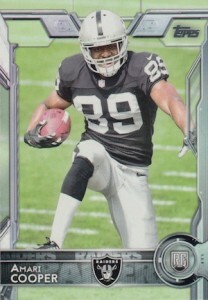 Exclusive to Target, the 2015 Rookies & Stars rookie card for Amari Cooper goes a little heavy on the design. While there are better styles to be found, the retail availability makes it more appealing for those without access to Hobby shops. 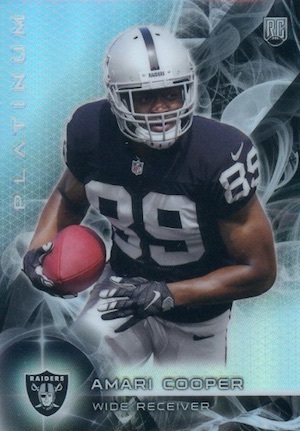 2015 Spectra contains three different Amari Cooper cards in the main set and each is limited to 99 copies or less. First, there are two base cards. While they feature different images, they are both numbered to 99. 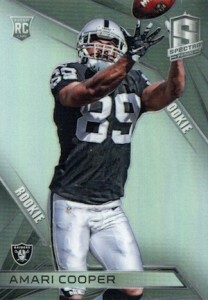 There is also an autographed patch card that is fundamentally similar to the Certified rookie card. 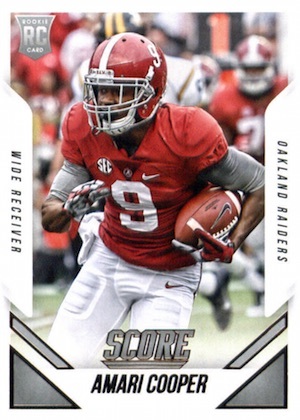 Like Bowman, 2015 Score is an early football release, but because Panini can use the college image, it does look better than an airbrushed uniform. That is further the case for Cooper given the Alabama connection. 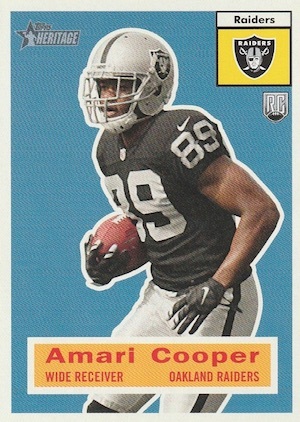 While the rookie card images are not the greatest in 2015 Topps, these are among the easiest Amari Cooper cards to find and will remain cheap. Shown on the right, the variation image card is a little tougher to track down. 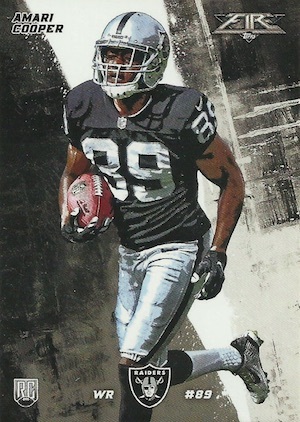 As the chromium version of flagship Topps Football, 2015 Topps Chrome does not offer any variety in terms of image or design. However, there are many Refractors and on-card signatures. Just like the base release, Chrome offers a limited image variation. 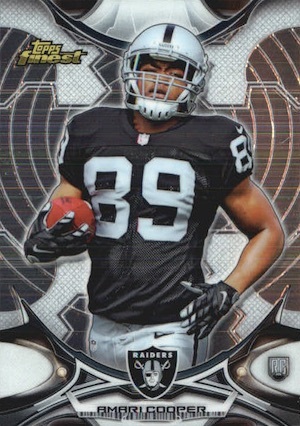 The 2015 mini version of Topps Chrome changes nothing other than the sizing, it but gives completists and mini collectors something else to go after. 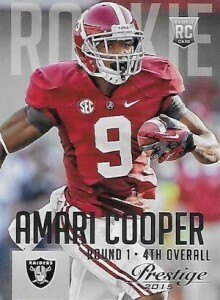 One the most premium Amari Cooper rookie cards under the Topps banner comes in 2015 Definitive Collection. The RPA card is limited to 50 copies, but there are additional on-card options for Cooper that are also impressive. 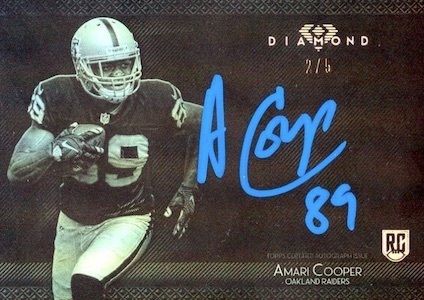 Another high-end choice, 2015 Topps Diamond is limited to just 10 copies but there are nine different versions for Cooper. The set also plays with various metallic ink colors. 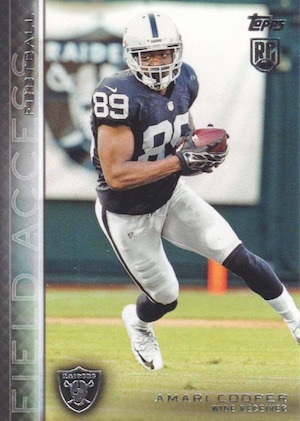 2015 Field Access was a sticker dump at the end of Topps' NFL license but the base set does have some solid action images. Ultimately, the insert photographs are better than the base selection for Cooper. In true form, the 2015 Finest design goes big. 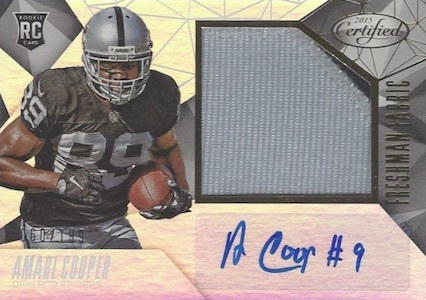 While the background is, perhaps, a little too hypnotic, the silver-and-black combo goes well with Cooper's Raiders colors. The Tyson Beck style is a nice change of pace for those who want an inexpensive card that is also unique. 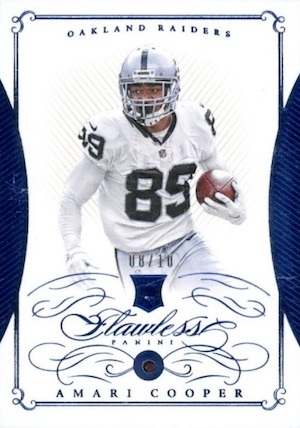 2015 Topps Fire is not for everyone, but the design can be as appealing as the price. A Target-exclusive release, 2015 Topps Heritage is a simple nod to the 1956 design. 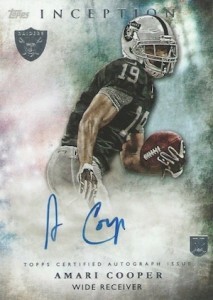 Cooper has a base card and sticker autograph. 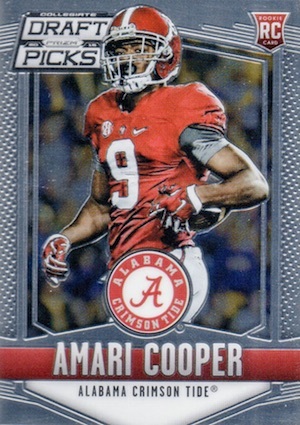 Quite a bit more complicated with a tiered rarity for the background patterns, collectors who like a challenge should check out the acetate Amari Cooper rookie cards in 2015 High Tek. He is part of the Group B patterns with at least six options. Cooper also has an on-card autograph. 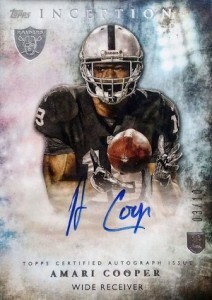 Arguably the most popular of the early-season releases, 2015 Inception makes its name based on a quality design that is also the first to offer on-card signature for the rookies. 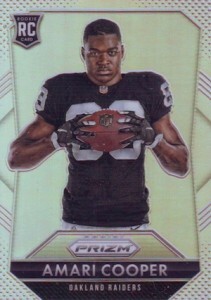 Although technically an insert, most collectors treat them as official rookie cards. 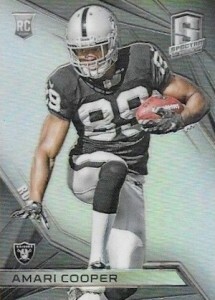 The base version is joined by a very limited image variation (#/10), but both show the #19 jersey instead of #89. 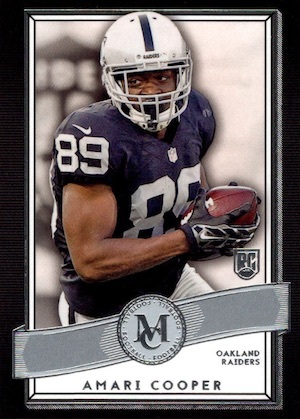 Viewed as a premium NFL product filled with hits, Cooper is actually in the true base set for 2015 Museum Collection. Of course, he has multiple autographs and relics, as well. Looking like a chromium Inception/Valor or a new take on Finest, 2015 Platinum hardly feels fresh but it can be great if you love chasing down player rainbows as it has a large Refractor lineup. 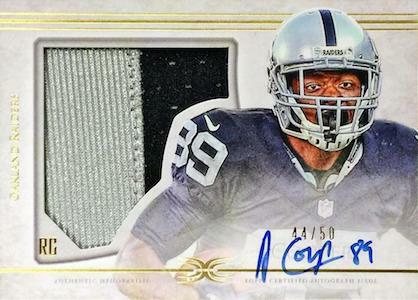 2015 Strata is yet another set featuring acetate and on-card signatures. There are certainly worse pairings than this and Cooper comes in three different versions. 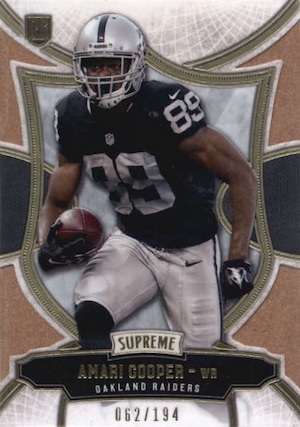 2015 Supreme contains an ornate base rookie for Cooper. 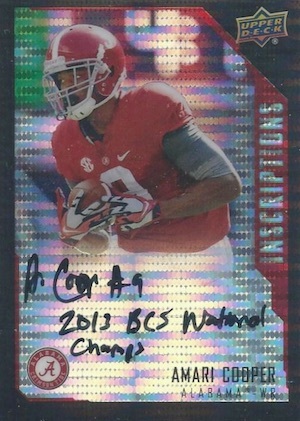 However, while most rookies also have hard-signed cards, Cooper has sticker autographs. The positives in 2015 TTT include the low print run and high-quality attributes. The negatives center around the sticker autograph and cramped layout. 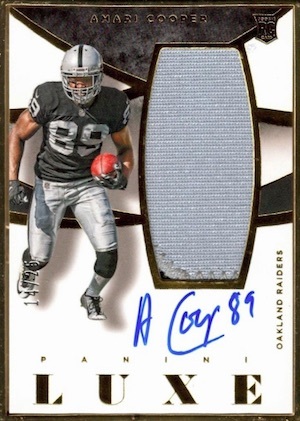 Looking very similar to the main Topps Inception design, 2015 Valor at least offers the correct jersey number for Cooper. The look may not appeal to all collectors, but Valor is a solid low-end choice. 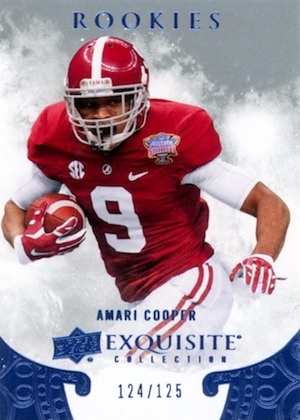 Likely the final Exquisite to feature college jerseys for a while, 2014 Exquisite was issued late in the collecting year and included an insert set for the 2015 rookie class. 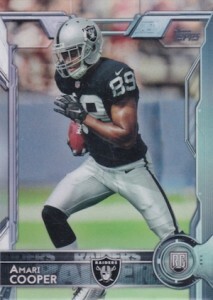 The card provides a nice option if collectors want something a little different from a standard Amari Cooper rookie card. Long known for working around their lack of league licensing, Leaf has carved out a strong market for their early-season football products. 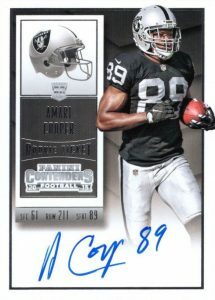 Chief among them is 2015 Leaf Trinity, which includes three different Amari Cooper cards that are each signed on-card. 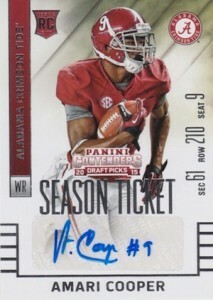 Part of the NCAA push from Panini, the 2015 Contenders Draft Picks is a college-themed release. 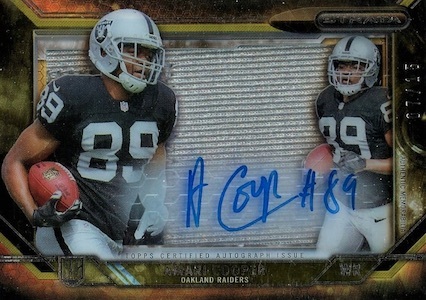 Collectors can find two different Season Ticket versions for Cooper, both of which are signed. 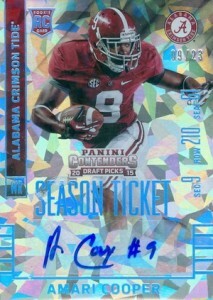 A solid budget option for Crimson Tide fans, Panini also gave Prizm the college treatment in 2015 Prizm Draft Picks. 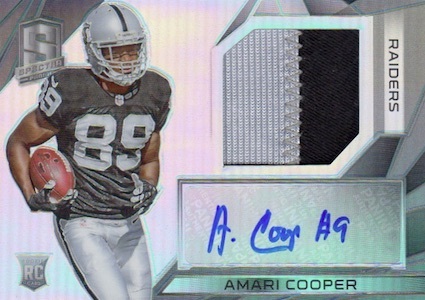 The red of the uniform stands out in a fantastic way on this Amari Cooper card. 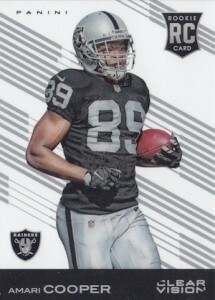 Both part of short-print subsets, these 2015 Upper Deck Amari Cooper cards feature increasing rarity and alternating jerseys. Card #150 is part of the group that averages 1:12 packs across all formats while #217 is decidedly more difficult at 1:12o and exclusive to Hobby boxes. While there is really not much to 2015 UD Inscriptions, the different parallels make for an interesting chase if a collector is so inclined. 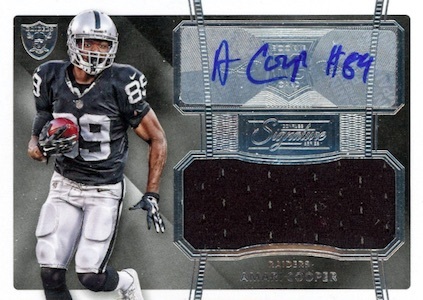 Each parallel features a different inscription and, in addition to a base version, Amari Cooper has a Red (#/49), Black (#/25) and Gold (#/10) parallel. Hey, could you update this? I’d love to see a full collection of what’s out there. robbb � We just posted this about a week ago. It is updated. how often do you guys update these lists/post new lists?